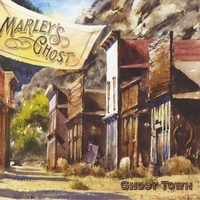 With Marley's Ghost's latest release, Ghost Town, there is something contemporary and appealing in the handling of what are essentially old-fashioned country western folk songs - dare I say cowboy folk music. Marley’s Ghost, cited by Paste magazine as “(having) earned cult-band status over 20 years of spirited musicianship, multi-part harmonies and irreverent humor,” returns from a three-year absence from recording with a new album, Ghost Town, on Sage Arts Records. The new album was produced by Cowboy Jack Clement, in whose Nashville home studio it was recorded. The cover was painted by acclaimed American watercolorist William Matthews.